Do you remember this? Just like an iphone isn't it? Well, they were here not too long ago and yet our kids start wondering what that piece of junk was meant for. I still remember when I had to stick my finger on the rotary dial of one of these vintage telephones and wait till it turned back. Now they are retro collectibles to amuse your visitors. 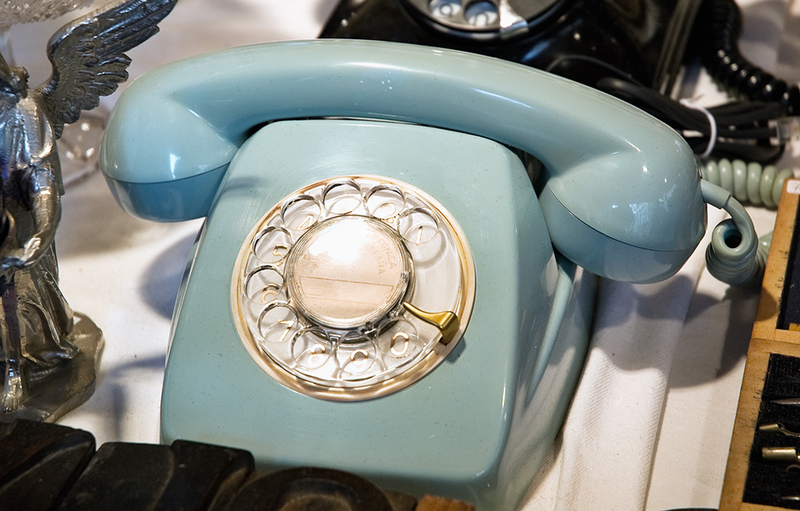 Antique phones still look beautiful though, especially those Western Electrical 51AL Candlestick telephones. But why don't you check the Antique Telephone History Website for more information and some images. Those vintage phones are great, so much classier than what we have today! The markets in Barcelona can turn up some great gems. -Thanks Kelly. Yes, plenty to buy or just admire in those markets. There is something so very appealing about this photo. This beautiful old blue phone with the gold tone around the dial is exquisite. I bet it was considered a "designer phone" in its day. I think this is a shot that possibly no other photographer would have thought to compose. Very special! I'm gonna get one and put it next to my typewriter. This is so cool! I love antique telephones. They're so beautiful and unique.